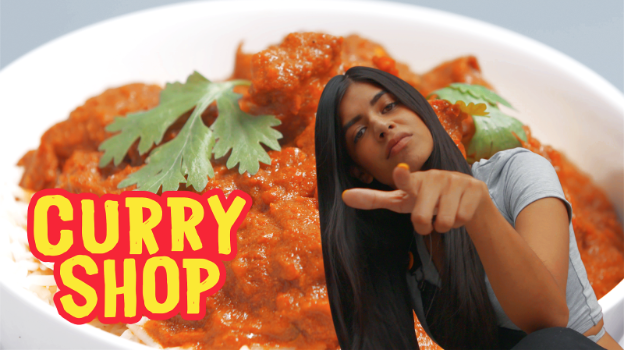 Canadian-Indian artist Jasleen Powar, better known as Horsepowar, is exploring the depths of cuisine as the host for the new hit series, “The Curry Shop.” A collaboration between Complex, First We Feast, and Bira 91, the series shows how the hip-hop industry is tastefully aligned with the food industry. In the six-episode season, curry is introduced throughout different cultures from restaurants in NYC and LA. 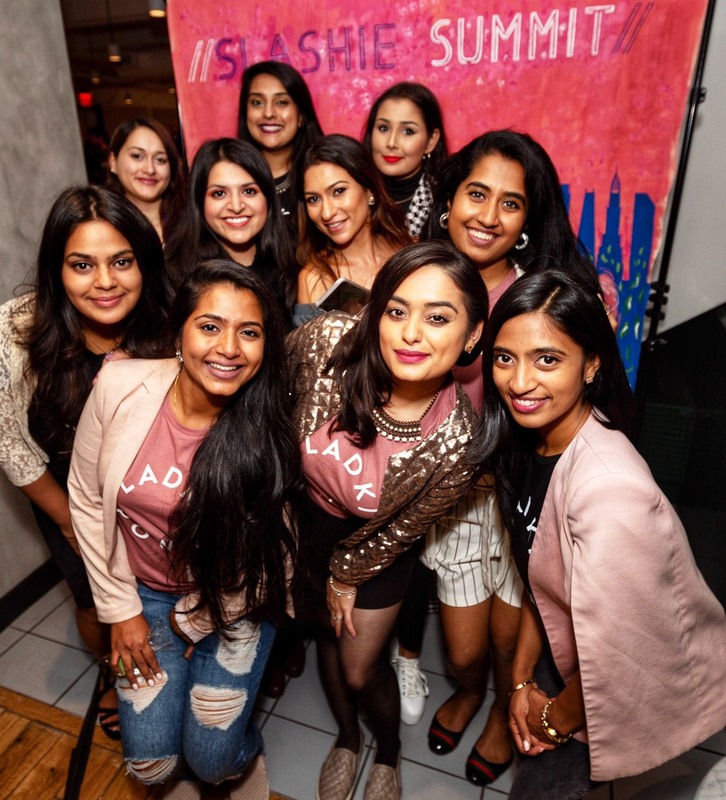 Breaking the ideology that curry is only Indian cuisine, Horsepowar shares the flavorful dish with stars like Sean Paul, Chi Ching Ching, and Rina Sawayama, all pay homage to their home countries while Horsepowar learns more about her own South-Asian identity. 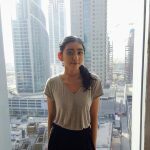 I spoke with the artist to learn more about her experience hosting “The Curry Shop” and with her connection to food and music. What has hosting The Curry Shop been like?? It’s been a great deal of learning and growth…taste-wise and the ability to host a show. Having an intellectual conversation with someone, eating, and looking cute is a lot harder than it seems. It’s different with a camera set and crew. I don’t eat the most graciously, I eat like a camel. Which episode has been your favorite thus far? Sean Paul was so fun. Just the energy and the new artist he brought… I was so lifted. Even everyone on set when we left was like ‘Wow what a great Sunday.’ I was coming down with a cold but he made me forget. He really was the life into the room, so positive making us dance and sing. And, I learned so much about Jamaican food. Another favorite one was the hot pot with Ronny Chieng. I love hot pot. That episode was a blast. All six episodes had their perks and I found I was getting better as a host. It was empowering for my craft. How was hosting the Indian curry episode with Aasif Mandvi?? We ate at a high-end Michelin starred restaurant, Junoon. I’m used to eating Indian food at home or at weddings. I never saw how a beautiful and important pedestal Indian cuisine can be put on. It’s amazing to see how far Indian food is being put out there. The ghost chili chicken appetizer was so spicy and I’m not so great with spice. Weird being Indian, I know. Aasif Mandvi is so cool and eating with him was fun. And, was eating Indian food at this restaurant a familiar or foreign feeling? This was familiar, but different because it was done in a unique way with the high quality and fanciness. When you go to India, the 5-star hotels are much nicer than here. The service is amazing. People do find Indian or Mexican cuisine and regions of a cheaper quality. Like, they think you shouldn’t have to pay ‘this much’ for Indian food. And at Junoon, they showed how this is a 5-star bougie restaurant. If you want it, we’ll give it. What has been your favorite curry so far? Indian, because it’s the most familiar. I really liked the Jamaican oxtail, too. And, also the Malaysian hot pot curry. It was a thinner version of curry, almost like a soup form. I’m a big soup girl; I love pho and ramen. The Japanese curry I tried changed my life. It was sweet like an apple chocolate taste, not too overbearing. It was warm fulfilling, good, nourishing ingredients… a whole other tastebud. Sweeter than savory and didn’t seem like it was curry. How do you connect hip-hop to curry? I knew historically what curry was. It’s so similar to hip-hop. Like hip-hop, curry was created as a necessity. It was a blend of spices – sometimes incorporating meat, that’s not good quality. But, in curry, you create a high-quality dish. When you look at that, hip-hop in a sense, someone took something flipped it with break dances, a DJ, and MC. It’s taking something that exists, flipping it, and providing a new meaning. How do you think something seemingly simple as curry can introduce different cultures to people?? Curry traveled throughout the world because of colonialism. It’s traumatizing for many cultures. With curry, people gave their own spin and made a stamp. That journey is so tremendous. Throughout hosting the show, I didn’t even know about the things I was learning. I thought curry was whatever. Then, people—like Rina Sawayama, from Japan—talked about how curry was a childhood staple dish their mom made. It shows how similar we are. So you wrapped up your last episode eating Korean curry with Jay Park – what was that like? I was unaware it even existed. I’ve only had Korean BBQ and the other dishes we tried were very new. Jay Park was so kind and his message through his music is so real. Good things like unity and talking about the world. It was a great last dish. It’s a blessing, to say the least. I can’t believe this is my job and recapping this is so great. What kind of response have you gotten from viewers? People really like it. I get nervous going to comments, so I stopped. But, I see a lot of people saying we love her! I even joked around and asked my cousins if they’re making fake accounts. People watch and I continue to see an outpour of love. I’ve learned more about curry and the food content industry overall. I’ve engaged myself a lot, especially a food I was embarrassed to eat around non-Indian people. It’s nice to have this collaboration and platform. It’s resonating with so many people and it’s nice to provide that as a host. 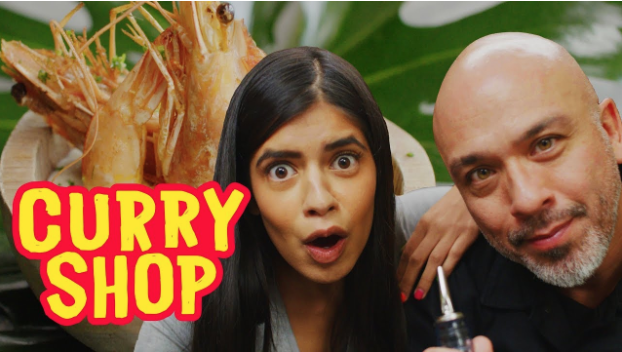 You can watch the full season of “The Curry Shop” on YouTube. You’ll Want to Gobble Up this Guyanese-Style Goat Curry in Minutes! The Need to Stop ‘Columbusing’ Curry and More! What Do Donald Trump and Curry Have in Common?